In 1975 I was an Art student at the University of California, Irvine. 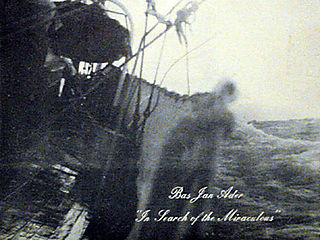 I signed up for a course called “studio problems.” There I met the Dutch-born Artist, Bas Jan Ader. Bas Jan had us each bring in works of Art we had created and we began to have discussions about them. I was surprised, how little there was to say about Art, especially “student art.” Bas Jan had us read exerpts from Hegel, and had us explore and test the boundaries of what Art was. Not just art, but Art with a capital “A.” Bas Jan once in a rare moment of openess, shared that Art was something that woke him up in the middle of the night, and the sheets were drenched with sweat, and he couldn’t go back to sleep because of the how incredible it was. He rarely showed this kind of emotionalism or passion. The two classes with Bas Jan changed my view of Art, and the world, and Life forever. As a result of Bas Jan’s teaching, I found my performance Art vastly improved. After doing a piece, I would be walking around campus, and noticed people stopping and pointing at me, professors would look my way and smile. I started to get what Bas Jan was searching for. Art that would make a powerful, meaningful, impression on people. When Bas Jan invited me to be part of a performance he was creating for the Claire Copley Gallery in Los Angeles, I felt like he was telling me that I had done well as one of his students. 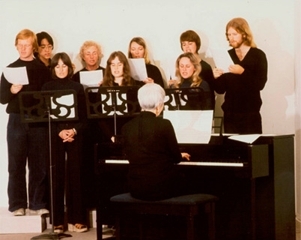 In the third photo, which is documentation of the performance, that’s me in the back row on the left. We are singing “sea shanties” along with the piano. None of us were trained singers. We were just students and acquaintances of the Artist. A short time after this performance, he drove his 12.5 foot sail boat, the Ocean Wave, to the east coast and launched himself across the Atlantic. There was talk of how all Bas Jan would survive on was a case of Metrocal, a canned diet drink. Originally written on 5/25/2010 and transferred from the now defunct vox.com. My name is Machteld Rullens. 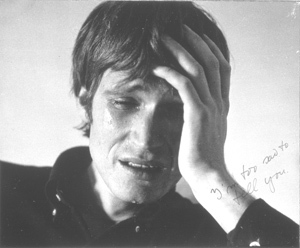 I’m a dutch artist and very interested about your participation in Bas Jan Ader’s class. I would like to talk to you about the sea shanties you sang. Do you remember anything about that? Could you send me your email or phone number so we can have a conversation about this performance? I emailed you my contact information. We opened with BEAUTIFUL SEA. Next I believe it was A LIFE ON THE OCEAN WAVE. Then it was COME, OH COME WITH ME. There might have been a fourth song, which I cannot remember. We closed with a reprise of BEAUTIFUL SEA. Since then Pedro has been researching for a book about Bas Jan. He interviewed me using email last year, and I am looking forward to his book being published in the future.